Pakistan today successfully conducted training launch of short range surface to surface ballistic missile “Nasr” to enhance the operational efficiency of Army Strategic Forces Command besides re-validating the desired technical parameters. 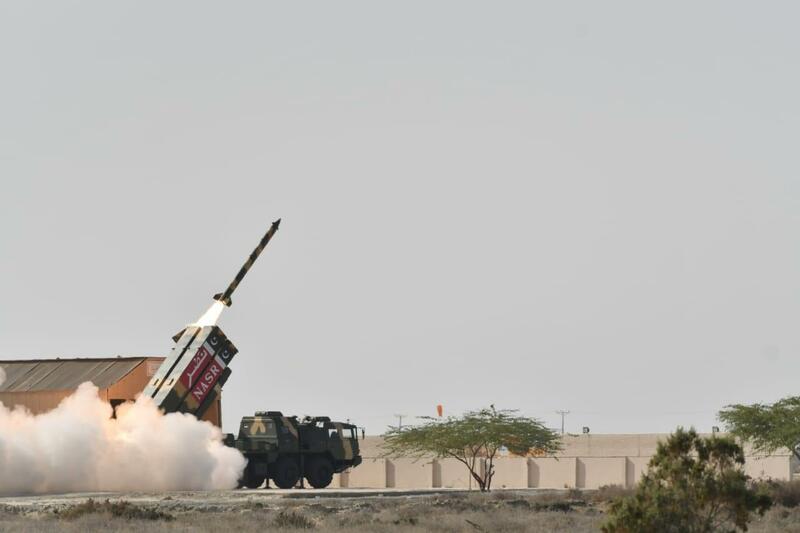 Pakistan today successfully conducted training launch of short range surface to surface ballistic missile “Nasr” to enhance the operational efficiency of Army Strategic Forces Command besides re-validating the desired technical parameters. This training exercise involved launching of quad salvo for desired effects. Nasr is a high precision, shoot and scoot Weapon System with the ability of in-flight maneuverability. This Weapon System has augmented Full Spectrum Deterrence posture remaining within the precincts of policy of Credible Minimum Deterrence, against prevailing and evolving threat spectrum more effectively including enemy’s ballistic missile defence and other Air Defence Systems. The launch was witnessed by General Zubair Mahmood Hayat, Chairman Joint Chiefs of Staff Committee, Director General Strategic Plans Division, Commander Army Strategic Forces Command, Chairman NESCOM, senior officers from the Army Strategic Forces Command, scientists and engineers of strategic organizations. Chairman JCS Committee appreciated the standard of training and operational preparedness of Army Strategic Forces Command. He also congratulated the scientists and engineers on developing this sophisticated Weapon System to enhance Pakistan's deterrence capability. He expressed his complete confidence in effective command, control and security of all strategic assets and measures being taken to augment these aspects.